How Many Roll Units Are Needed? 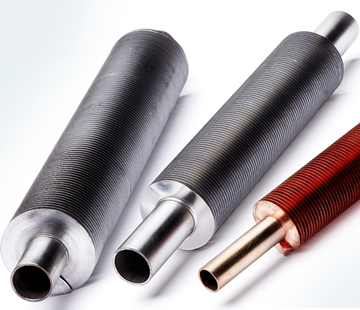 Several electric resistance welding (ERW) processes are available for tube and pipe production. While each process has different characteristics, all ERW processes have one thing in common–all of them produce a forged weld. 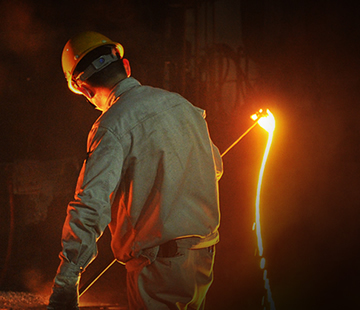 A forged weld is created by applying a combination of heat and pressure, or forging force, to the weld zone. 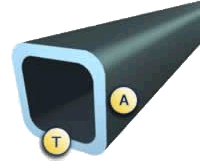 A successful forged weld uses the optimum amount of heat, which is normally slightly less than the melting point of the material, and a nearly simultaneous application of circumferential pressure to the section, which forces the heated edges together (see Figure 1). As the name implies, the heat generated by the weld power is a result of the material's resistance to the flow of electrical current. The pressure comes from rolls that squeeze the tube into its finished shape. The two main types of ERW are high-frequency (HF) and rotary contact wheel. 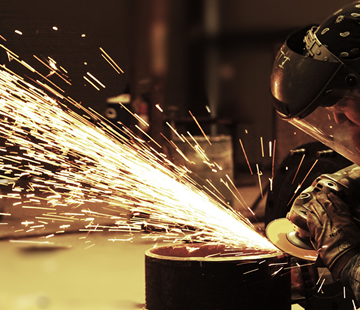 The two main aspects of HF welding are processes and power supplies. Each of these can be broken down further into subcategories. Processes. The two HF welding processes are HF contact and HF induction. In both processes, the equipment that provides the electrical current is independent from the equipment that supplies the forge pressure. Also, both HF methods can employ impeders, which are soft magnetic components located inside the tube that help to focus the weld current in the strip edges. HF Induction Welding. 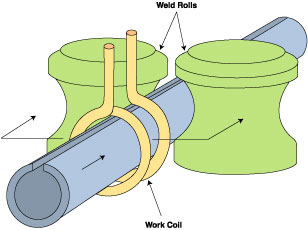 In the case of HF induction welding, the weld current is transmitted to the material through a work coil in front of the weld point (see Figure 2). The work coil does not contact the tube--the electrical current is induced into the material through magnetic fields that surround the tube. HF induction welding eliminates contact marks and reduces the setup required when changing tube size. It also requires less maintenance than contact welding. 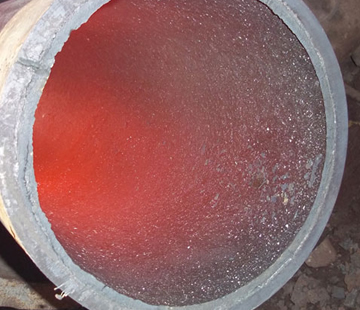 It is estimated that 90 percent of tube mills in North America use HF induction welding. HF Contact Welding. 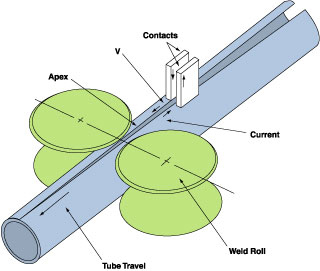 HF contact welding transfers weld current to the material through contacts that ride on the strip (see Figure 3). The weld power is applied directly to the tube, which makes this process more electrically efficient than HF induction welding. 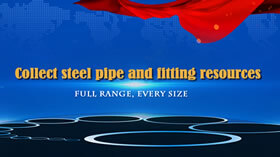 Because it is more efficient, it is well-suited to heavy-wall and large-diameter tube production. Power Supplies. HF welding machines also are classified by how they generate power. The two types are vacuum tube and solid-state. The vacuum tube type is the traditional power supply. Since their introduction in the early '90s, however, solid-state units have quickly gained prominence in the industry. It is estimated that between 500 and 600 of each type are operating in North America. In rotary contact wheel welding, the electrical current is transmitted through a contact wheel at the weld point. The contact wheel also applies some of the forge pressure necessary for the welding process. The three main types of rotary contact wheel welders are AC, DC, and square wave. In all three power supplies, electrical current is transferred by brush assemblies that engage slip rings attached to a rotating shaft that supports the contact wheels. These contact wheels transfer the current to the strip edges. AC Rotary Contact Wheel Welding. In an AC rotary contact wheel welding machine, the current is transferred through the brushes to the rotating shaft, which has a transformer mounted on it. The transformer reduces the voltage and increases the current, making it suitable for welding. The two legs of the transformer's output circuit are connected to the two halves of the rotating contact wheel, which are insulated from each other. The strip completes the circuit by acting as a conductor between the two halves of the wheel. Traditional rotary contact wheel welders used 60-hertz AC, or common line current. A drawback to this system is that the current--and therefore the weld heat--rises and falls, limiting the speed at which the tube can be welded. 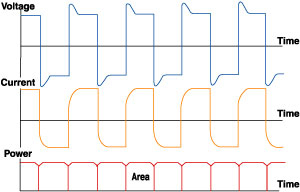 An AC sine wave reaches its maximum amplitude briefly, producing weld heat that varies just as the sine wave does (see Figure 4). To help even out the heat variation, motor generator sets were introduced to create AC at higher frequencies. Some of the frequencies used were 180, 360, 480, and 960 Hz. A few solid-state units also were produced to generate higher-frequency currents. An AC sine wave at 960 Hz reaches its maximum amplitude 1,920 times per second, as opposed to 120 times per second with a 60-Hz signal. The 960-Hz sine wave produces heat with a much more consistent temperature. DC Rotary Contact Wheel Welding. The next step in rotary contact wheel welding was the DC power supply. The power produced has a nearly constant amplitude. Although this solves the problem of varying heat, a major drawback is that higher maintenance costs are associated with this type of welding machine. Because it is not possible to change the voltage of DC with a transformer, it is necessary to transmit the high-amperage, low-voltage weld current into the shaft through a large number of brushes (92 for DC versus 8 for AC) with a high current density. Transmitting high-amperage, low-voltage current produces excess (waste) heat that causes heavy wear, resulting in the high maintenance costs mentioned previously. Square Wave Rotary Contact Wheel Welding. The latest step in the evolution of rotary contact wheel welding is the square wave power supply. This method combines the consistent weld heat of DC with the lower maintenance associated with AC units (see Figure 5). While rotary contact weld methods preceded the more commonly used HF welding processes, they still have a vital role in specialty welding applications. 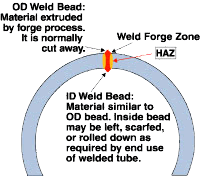 Rotary contact welding is useful for applications that cannot accommodate an impeder on the ID of the tube. Examples of this are small-diameter refrigeration-grade tube and tube that is painted on the ID immediately after the welding process. The types of weld pressure rolls, or squeeze boxes as they sometimes are called, that apply the pressure required for the weld are as varied as the welding units used to supply the heat. Squeeze boxes for rotary contact wheel welding typically have two or three roll units, with the contact wheel serving as one of the rolls. 3/8 to 2 in. uses two-roll units. 1/2 to 3 1/2 in. uses three-roll units. 2 to 10 in. uses four-roll units. Larger than 10 in. uses five or more rolls. Today, much more so than in the past, many shapes--square, rectangular, hexagonal--are welded in the finished shape rather than being reshaped after being welded round. The weld boxes used for the shapes are custom-designed for each application and usually have no more than five rolls.